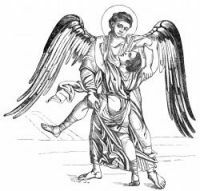 Christian Angels of the New Testament, while exempt from need and suffering, have sympathy with human sorrow, rejoice over repentance of sin, attend on prayerful souls, and conduct the spirits of the just to heaven when the earthly life is ended. 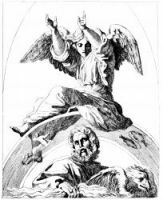 As early as the fourth century the Christian Church had developed a profound belief in the existence of both good and evil angels--the former ever tempting human beings to sin, and the indulgence of their lower natures; the latter inciting them to pursue good, forsaking evil and pressing forward to the perfect Christian life. This faith is devoutly maintained in the writings of the Fathers of the Church, in which we are also taught that angelic aid may be invoked in our need, and that a consciousness of the abiding presence of celestial beings should be a supreme solace to human sorrow and suffering. This series of images of Christian Angels are from my collection of antique Bible and art books. Feel free to use these pictures of Christian Angels in your artwork. 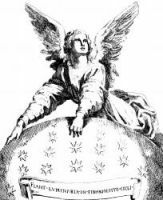 Click on the Christian Angel illustrations below to see more details about saving a free Christian Angel image or about purchasing the images of Christian Angels at a higher resolution.